Paul’s letter to believers in Ephesus helps all Christians to realise how rich is God’s grace to us in Jesus Christ. Filled with praise to God for all his spiritual blessings, the apostle encourages us to respond in gratitude with lives worthy of God’s calling. He makes clear that salvation is the work of God alone and ours by faith alone. Using the various parts of the physical body he explains the diversity and unity of the church, with every member working together under the headship of Christ. Paul gives practical advice for living as God’s people and being equipped in our spiritual struggles. Please pray that God would provide Farsi translators for our KYB studies. If you can help, please contact translation@cwci.org.au or 02 9740 4792. The theme of Proverbs is clearly stated: "The fear of the Lord is the beginning of knowledge" Proverbs 1:7. This "fountain of life" encourages everyone - the simple, the young, and those who think they are already wise - to learn and live by the wisdom and ways of God. It repeatedly stresses that the person who responds to God's love in reverent, humble obedience will enjoy God's blessing, care and protection along the path that leads to life in his presence. By the time John wrote his gospel, false teachers within the church were already trying to reduce or change the church's teaching about the person of Christ. 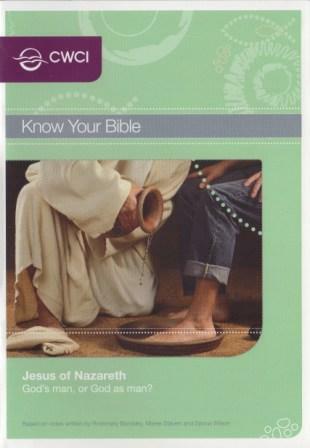 So John keeps before us the vital significance of understanding who Jesus Christ is and how we are to respond to him. John challenges us with faultless logic: if we do not have Jesus, we do not have life. If we do not believe that Jesus is God, then we do not know God. Good News! The Bible and its message. Good News can be used with people seeking God, or who have little background in the Bible. The first part (An introduction to the Bible) goes back to the basics: how we got our Bible; how to navigate around God’s word; the types of books in the Old and New Testaments. Part 2 (The message of the Bible) runs parallel to CWCI’s Statement of beliefs: in the beginning; who is God; who is Jesus; what is the gospel; who is the Holy Spirit; what is the church; what does our future hold? The long awaited Jesus of Nazareth study is about the life of Jesus – why He came, who He is, what He did while here on earth and about His coming again. We highly recommend this study. 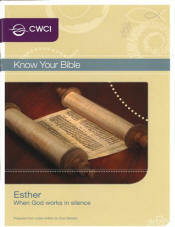 In 2013 the first KYB study in 'Accessible English' was produced - a study on the book of Esther. Esther AE was first used by KYB groups in the Solomon Islands and has now been translated into German, Dutch, Tamil, Marathi, KiKamba, Mandarin and Tok Pisin. The ‘Accessible English’ KYB studies are for groups and individuals for whom English is not their main language.